With the addition of this new component set, Superior Shooting Systems Inc. greatly simplified the installation of our SpeedLock Systems firing pin assembly in Remington firearms. 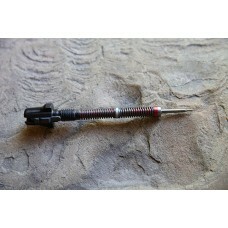 This new "drop-in" replacement assembly is complete with Firing Pin, CS Duo Spring, Cocking Piece, and bolt shroud. It is ready for installation in any correct-length Remington action. It will work with any rifle whether it has a J-Lock or not. SpeedLock Systems firing pins are a durable alloy composite construction with a 70-series aluminum body and a heat-treated 4140 steel pin front & tip. The CS (chrome silicon) spring is engineered to out-perform conventional music wire springs and provide a lifetime of service. They don't change over the life of the firearm. The combination of the lightweight SpeedLock Systems firing pin and CS Spring will provide a net reduction in lock time of nearly 40-percent. The result is simple: a reduction in lock time will cause your rifle to hit closer to where you held the sight when you pulled the trigger. Everyone's rifle is moving when it's fired. The amount of movement may be almost imperceptible, but that's all it takes. If you're shooting at a trophy deer at 300 yards, movement at the muzzle of only 0.058 inches means a missed animal. If you're a competitive silhouette shooter, just 0.022 movement makes the difference between a hit and a miss on a 500 meter ram. When lock time is reduced, the probability of hitting your target is increased. SpeedLock Systems helps squeeze that last ounce of accuracy from your rifle, and accomplishes this with a minimum of time, effort, and cost. The effect is amazing: by the time the firing pin has reached the primer on most rifles, the bullet has already left the muzzle on a SpeedLock Systems gun! Dry fire just once and you'll hear the difference! The cocking piece is tool steel and the bolt shroud is anodized aluminum. "SpeedLock was one of the first products I designed and it's still one of the most singly influential any shooter can experience. My Silhouette experience led me to develop products which reduce lock time, and SpeedLock pins combined with Chrome Silicon springs certainly helped in my success."